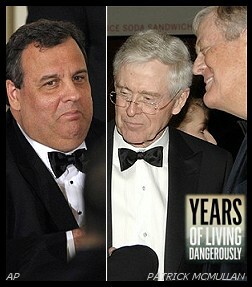 " BRAD BLOG's Christie/Koch Bros. Scoop Picked Up For Showtime's 'Years of Living Dangerously'	"
Over the weekend, Showtime's James Cameron-produced environmental documentary series, Years of Living Dangerously, released an online-only video segment focused on NJ Gov. Chris Christie's still-unexplained flip on the Regional Greenhouse Gas Initiative (RGGI). The video, as Grist describes it, "featuring food writer Mark Bittman grilling [Koch-funded] Americans for Prosperity henchman Steve Lonegan about climate change, muses on the possibility that Koch money funded Christie’s rapid retreat on New Jersey’s part in the regional cap-and-trade system RGGI." That is, of course, one of the issues we first posited when initially breaking the story, based on comments made during Christie's introduction at the seminar by David Koch. Here is the complete audio (and transcript) of Christie's address and his intro by Koch, who calls the Governor his "true political hero" while describing another secret meeting the pair had in New York City before Christie suddenly pulled NJ out of RGGI in May of 2011, just weeks before the Vail confab. "Another example of Governor Christie's commitment to the free enterprise system is that only a few weeks ago he announced that New Jersey would be withdrawing from the [Regional] Greenhouse Gas Initiative," Koch said proudly during his remarks to cheers and applause. The fossil fuel magnate then went on to lie to the crowd that RGGI "would have raised energy costs, reduced economic growth and led to very little, if any, benefit for the environment." On mention of the word "environment" a "boo" is heard on the audio from amongst the gathered millionaires and billionaires in attendance. "Five months ago we met in my New York City office and spoke, just the two of us, for about two hours on his objectives and successes in correcting many of the most serious problems of the New Jersey state government," Koch said. "At the end of our conversation, I said to myself, 'I'm really impressed and inspired by this man. He is my kind of guy.'" The crowd cheered loudly as Koch, whose estimated $22 billion personal fortune derives from his family's oil refinery empire, described Christie's unilateral withdrawal, on behalf of New Jersey, from a regional cap-and-trade market created by 10 northeastern states to curb industrial greenhouse gas emissions. (He neglected to mention that, in announcing the withdrawal in late May, Christie had acknowledged in no uncertain terms that climate change is real and that human activities contribute to it. "It's time to defer to the experts," he'd said.) There was an extended ovation when Koch, just before turning over the floor, expressed his hope of seeing Christie "on a larger stage where, God knows, he is desperately needed." « PREVIOUS STORY "What Ann Coulter SHOULD Have Tweeted: 'I Committed ACTUAL Voter Fraud'"
"BRAD BLOG's Christie/Koch Bros. Scoop Picked Up For Showtime's 'Years of Living Dangerously'"
Close. But not exactly. Justices Thomas and Scalia have been to Koch Summits, but neither were at the one discussed above, from which I have the audio tapes. At least not that I know of. I don't know that Roberts has been to one...though it wouldn't entirely surprise me if he had been.